March 24, 2018 by Laurie Leave a Comment This post may contain affiliate links, which means if you click on a link and purchase something, I may earn a small commission (at no additional cost to you.) See my disclosure policy HERE. 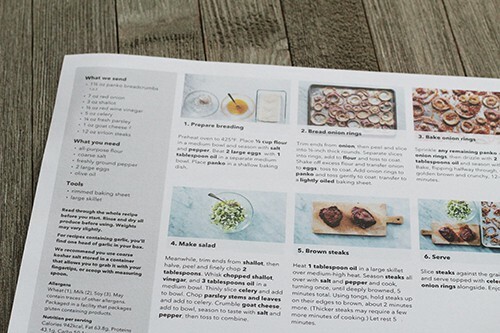 Martha Stewart's Meal Kit is currently on sale for $30 OFF for new members – that makes the small plan of 2 meals for 2 people only $18 (Just $4.50 per meal!) GO HERE to get yours before this offer ends, and meanwhile, check out PPP Team Member Cheryl's experience below! 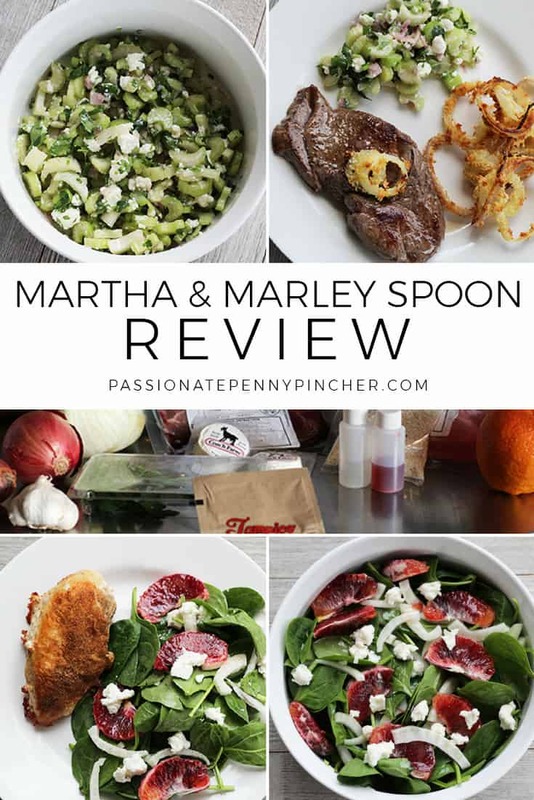 Hey everybody, this is Cheryl, PPP team member and here's my take on Martha & Marley Spoon! When Laurie asked me to take these two meals home from our Nashville retreat, I was apprehensive at best (I'm not well known for having a dinner plan … but I'm working on it)!! 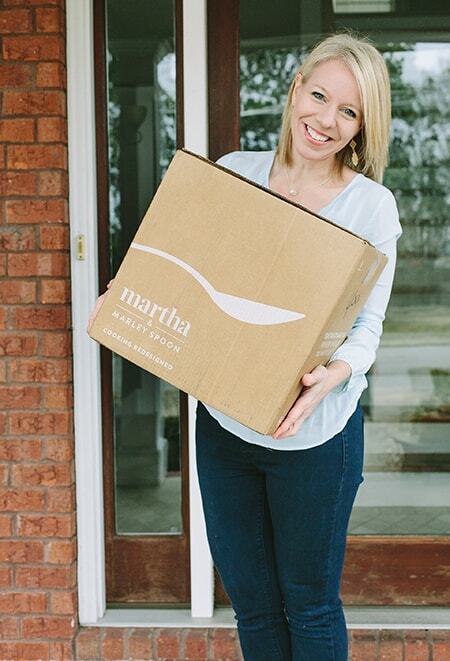 I'd not heard of the Martha & Marley Spoon delivery meals, but I will say, I was VERY impressed … like … wow … yummy … I can't wait to dive in, impressed with these meals! They come packaged exactly as you'd expect – insulated (to stay cold for 30 hours!!) 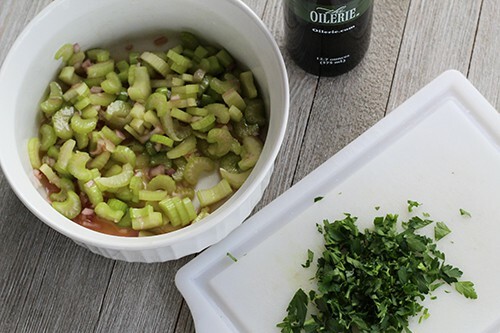 ~ and include the ingredients you'll need to cook and finish the meal (beyond some basic pantry staples). LOOK at those FRESH ingredients, SOoooo good! The instructions were easy for me to follow and I finished the meal in 40 mins start to finish … BONUS! 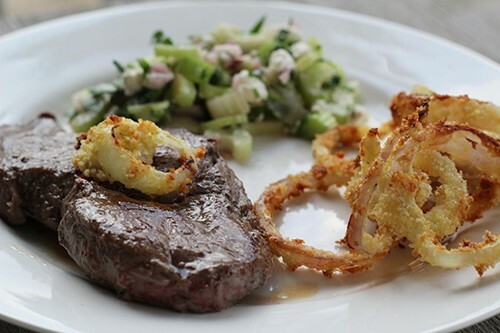 The first meal I cooked was Seared Steak and Onion Rings with Celery & Goat Cheese Salad (oh … the onion rings…). I LOVED that this recipe was a little unique!! 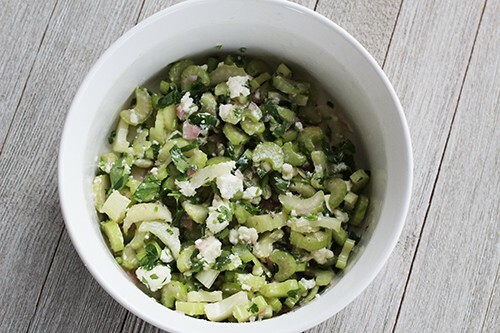 This was the celery and goat cheese salad ~ my husband and daughter (YES …. AND DAUGTHER … she's 12) enjoyed it!! 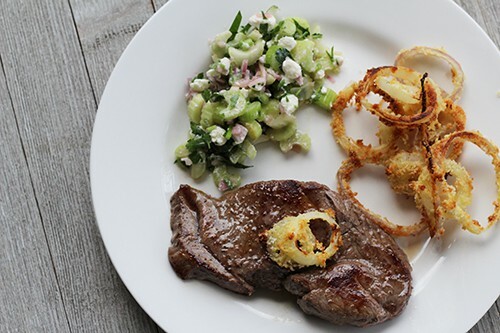 The onion rings … oh my … the onion rings!!! We'll never make them any other other way and SOoooo easy!! Who knew?? My husband was straight up in heaven ~ there really IS something to making dinner every night!!! We really felt like we had such a fancy meal and I still can't get over how easy it was! There was more than enough food for all three of us (I think I skimped on the onion rings and salad on this plate because there was PLENTY!!). 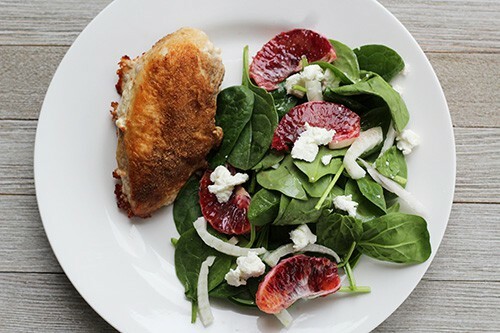 The second meal was chicken, Fennel Coriander Chicken with Blood Orange Spinach Salad to be exact! 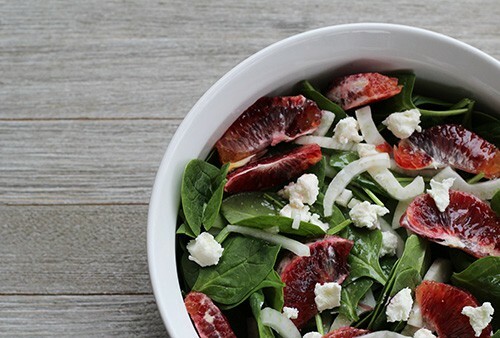 This salad was SO yummy (and beautiful!!)!! 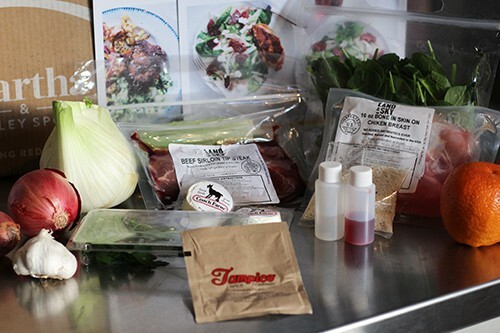 The flavors all came together and really woke up our taste buds! I can honestly say I've NEVER .. as in EVER … ever? 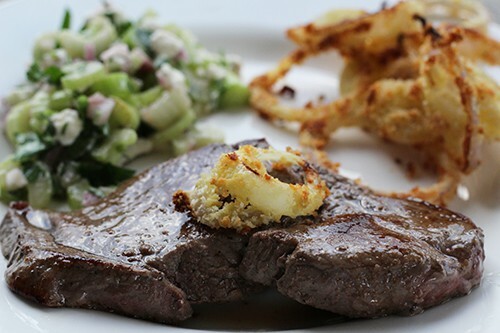 cooked with fennel. It was delicious!! 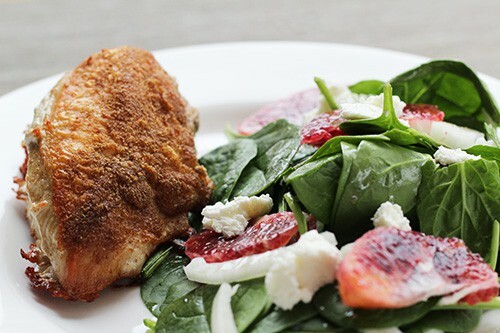 Even my 12 year old tried it and said it was okay (this is a raving review as the child will not eat a salad :)!! The chicken was seasoned to perfection and the whole meal really was delicious (I'm getting hungry just typing this up!). I LOVED that everything was EASY and I didn't have to do anything beyond cook the meal. I LOVED the unique ingredients and trying new things. ONION RINGS … did I mention we fell in love with the onion rings??? The price was less than going out to eat (and such a treat for dining IN) and with $30 off your first box, it really think it's worth trying. See how Jamie's kids reviewed Martha & Marley spoon!! Next time, I'm asking her boys to come and cook for me!